向坦克工厂投入60亿美元后，特朗普表示M1艾布拉姆斯是“世界上最好的坦克”。 [美国媒体] Pouring $6 bn into tank factory, Trump says the M1 Abrams is ‘best in the world.’ Is it really? “America does not need conflict. But if conflict comes, and you know the story – you’ve got to be strong if conflict comes – we will dominate the battlefield, and we will win, win, win. We’re now set up to win, win, win,” Trump said on Wednesday, as he appeared at the Lima Army Tank plant in Ohio. “They have to advertise American weaponry. Trump is making such advertising, yet it’s a big question if it really corresponds with the reality,” Litovkin told RT. 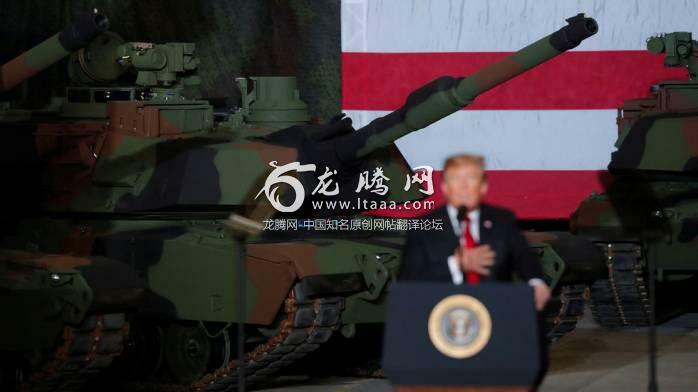 Modern war machines, produced in Russia and China, surpass the iconic US tank in many respects, military expert Alexey Leonkov told Vzglyad newspaper. Abrams is a decent tank, but it belongs to the past century. It's not the best tank in the world. It uses a gas engine which requires huge amounts of gas, and it weighs 70 tones. This means it can only be used efficiently on a hard terrain. It cannot be used efficiently during the fall and winter where the terrain is soft, as the tank will sink. It is not invincible. On the Internet you can see destroyed A-1 tanks. And they do burn when hit. Yeah....did well on its debut didnt it.....only needed 2 tow trucks to drag it off the parade ground! Yes, it could be the best but if and only if when accompanied by AWACS, front support fighter aircrafts and real time imagery satellites. So what have we learned? We've learned that Washington has money to spend and the so-called "socialists" need to spend it before it goes to the military where they will design and build a tank that can fly! A10 tank buster aircraft just about a tank with wings. Another $6,000,000,000.00 give away to the MIC. Dose Flint MI have clean water yet? No now they barely recover lead in water and now the water got contaminated by toxic chemical. US tanks are not one of the best, but far from the best ! Leopard 2 has a design flaw like the SDF have shown. The days when tank protection was just about thick heavy side armour is gone. It might be the best tank in the world, but so what. Any helicopter gun ship renders tanks sitting duck targets. They’re like aircraft carriers; nothing more than trip wires for war. No aircraft carrier would last more than an hour in the event of WWIII and I suspect every M1 tank in Europe wouldn’t last much more than that. The US government is badly prepared to re fight World War Two, with most complex new weapons systems unable to be maintained and less than half of them even capable of deployment at any one time. TRUMP another campaign promised, "Bring Back jobs in the US." Chrysler moved their MI Abrams production to Canada due to 42% corporate tax in the US. US lost 70,000 manufacturing Co. since Bill Clinton. Obama said "End of Manufacturing in US, only a Magic Wand can bring them back". Trump brought the Magic Wand reduced Corporate tax to 12-20%. US corp are coming back. M1 Abrams Tank is made by Chrysler and Gen Dynamics in OHIO. When I see a tank I think of little crabs that you see on the warm beaches. Looks like the US is building weapons for WW2 type wars! US, it's 2019! The u.s is a second rate military, AT BEST. Seems like the best way to settle this question would be for the U.S. Army to send a team with an M-1 to compete in Russia's annual Tank Biathylon, which, if I recall correctly, was won last year by the Russians. Tanks today are the equivalent of battleships in WW2. They can operate only under conditions of air supremacy. The Germans found that out with the Bismarck and the Japanese with the Yamato. The Bismarck was disabled by a biplane - a slow, 140 mph Swordfish. The Yamato never got close enough to a US surface vessel to fire its main guns. It resorted to firing its main guns shotgun style against aircraft. If it was "the best in the world", it would not need a $6 billion upgrade. Jezz -Letting a draft dodger make any comment on a war machine is like letting a Vegan recommend a good Steakhouse. In this day and age Tank manufacturers are just glorified overpriced Coffin makers. I bet Donny only wants to fund them because he and his son in law get to pocket some of the funds. It's the best of an antiquated machine. Tanks are rendered useless when ship based, air based, and space based defenses can take them out.